BACKGROUND AND PURPOSE: The side effects of cyclooxygenase-2 (COX-2) inhibitors on the cardiovascular system could be associated with reduced prostaglandin (PG)I2 synthesis. Microsomal PGE synthase-1 (mPGES-1) catalyses the formation of PGE2 from COX-derived PGH2 . This enzyme is induced under inflammatory conditions and constitutes an attractive target for novel anti-inflammatory drugs. However, it is not known whether mPGES-1 inhibitors could be devoid of cardiovascular side effects. The aim of this study was to compare, in vitro, the effects of mPGES-1 and COX-2 inhibitors on vascular tone in human blood vessels. EXPERIMENTAL APPROACH: The vascular tone and prostanoid release from internal mammary artery (IMA) and saphenous vein (SV) incubated for 30 min with inhibitors of mPGES-1 or COX-2 were investigated under normal and inflammatory conditions. KEY RESULTS: In inflammatory conditions, mPGES-1 and COX-2 proteins were more expressed, and increased levels of PGE2 and PGI2 were released. COX-2 and NOS inhibitors increased noradrenaline induced vascular contractions in IMA under inflammatory conditions while no effect was observed in SV. Interestingly, the mPGES-1 inhibitor significantly reduced (30-40%) noradrenaline-induced contractions in both vessels. This effect was reversed by an IP (PGI2 receptor) antagonist but not modified by NOS inhibition. 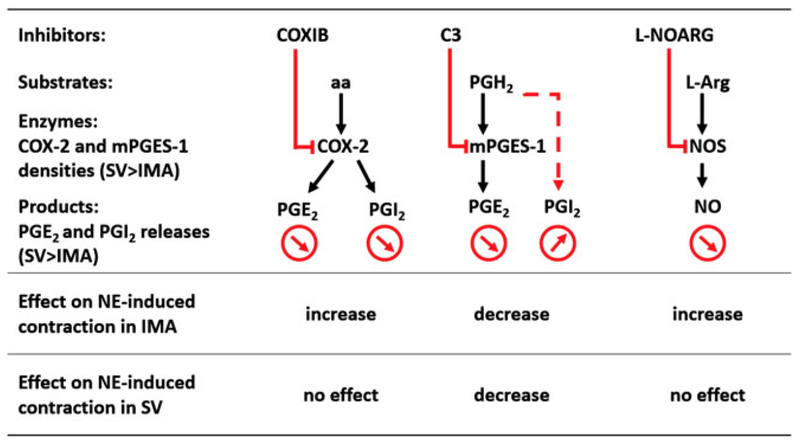 Moreover, PGI2 release was increased with the mPGES-1 inhibitor and decreased with the COX-2 inhibitor, while both inhibitors reduced PGE2 release. CONCLUSIONS AND IMPLICATIONS: In contrast to COX-2 inhibition, inhibition of mPGES-1 reduced vasoconstriction by increasing PGI2 synthesis. Targeting mPGES-1 could provide a lower risk of cardiovascular side effects, compared with those of the COX-2 inhibitors.